crossed the Atlantic Ocean as you enter the showroom at 727 Kingsley Avenue! For a truly personalized gift, choose from items that include everything from gourmet foods and candies, to coffees and teas, luxurious bath products, linens and fine bone china along with many more specialty imports from around the country and Europe. Patricia Sessions, owner of Basketique, will personally design your gift basket or package to your specifications, creating a perfect gift for an important client or a special someone. Pat purchased Basketique in 2005. At that time ,a needlepoint shop shared adjacent space under the same roof. In 2008, the space became available for a new use. Pat jumped at the chance of running an old-fashioned tea room to complement the gift basket shop. The idea was well received, and the "serving of tea" became an avenue for demonstrating the many gourmet foods in the shop. 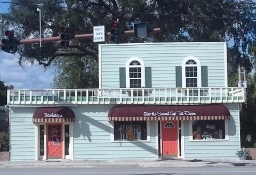 Subsequently, Pat bought the building and began expansion of the tearoom. Naming it was easy. For many years her mother had written a regular column for the local newspaper in Pat's hometown of Orangeburg, SC. The title of her column provided the inspiration for the "Over the Second Cup" Tearoom. Orange Park Station was built in the early 1900's by the Atlantic Coast Line Railroad to serve the community of Orange Park, FL. Located 14 miles from downtown Jacksonville, Orange Park was a stop for the many passenger trains that plied the rails from New York to Tampa/St. Petersburg, FL. the house track branching off behind the station to a small freight house. Sometime in the 1920's, a new main line bypass was laid, leaving the original main a through spur for the locals. The station remained active until the sixties and passenger service went from a regular stop to a flag stop. The old main line through was cut with the widening of Kingsley Avenue and eventually sold. The station was modernized and used as offices, shops and even a restaurant. It then housed Needlepoint Gallery and Over the Second Basketique. The two remaining tracks were used as storage and maintenance of way equipment and unloading rock and limestone for construction. Orange Park Station had grown up in weeds and trees and was almost unrecognizable as a railroad station. 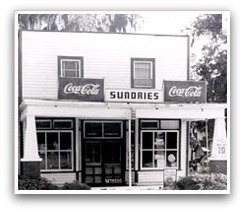 Late in 1992 an offer was placed and accepted for the purchase of the property by Jack Heard of Fernandina Beach, FL. Heard is the owner of the PV "Georgia 300". Following the purchase, Heard intended to upgrade the old main line spur and simply fence around the area to use as a storage for the "Georgia 300". Finding the old rail was 85 lbs. with the cross ties rotten and the tie plates missing, it was decided that it might be necessary to remove the old main line and rebuild. The same was true for the old freight house lead. With so much involved to rebuild, Heard decided to start from scratch and rebuild a car park. Jeff Davis of First Rail Construction began work in January 1993 and completed construction in May. In addition to the new 100 lb. rail, ties and ballast, 240 volt power, water and compressed air were added. A concrete pad surrounds the three tracks with button blocks and a chain link fence surrounds most of the property across the front. Old brick columns were built and a wrought iron fence and gates were constructed to reassemble the old railroad depots of the past. The new Orange Park Station opened September 1, 1993. The station has enough track for 12 cars, 10 on power, water and air. Gil McArthur, President of G&LM services is now leasing and managing Orange Park Station, located in downtown Orange Park. The Georgia 300 is a privately-owned, completely refurbished, vintage railcar originally placed in service in the 1930's. It is famous for its many celebrity passengers, ranging from actors to Grammy Award-winning artists to Presidential candidates. It was exciting to see the Georgia 300 on CNN carrying the new President-Elect, Barak Obama, and Vice President-Elect, Joe Biden, to the inauguration in Washington, D.C. in January, 2009. A framed presidential seal displayed in the observation area was a gift from President Bill Clinton after a campaign trip in 1996.
accommodations at these events for various Georgia governors and other dignitaries. It was later even parked at the World's Fair in Knoxville, TN, and its rooms offered for rent. The Georgia 300 is richly appointed with cherry wood wainscoting and furnished with luxurious seating, bedding and other objects of refinery. Two of the car's bedrooms have double beds and a shared bathroom. The dining room, which seats eight, includes an antique table and buffet from an old office car.The railroad signature china is exquisite and the linen napkins are even embroidered with the car's name. Diners enjoy their meals by candlelight and are served by chefs and stewards in white jackets. The most sought after vantage point is the platform, where a rider can feel the wind rushing by and can operate the backup whistle. The Georgia 300 and several other private railcars are parked on a beautifully landscaped siding at the site of the old depot in Orange Park, FL. Although the Georgia 300 is not open to the public, she and many other private cars can be leased for trips. Information can be found online at www.aaprco.com/travel/cars-for-charter or by contacting Jack Heard at First Coast Rail, Inc., PO Box 693, Fernandina Beach FL 32035. © 2012 Basketique Inc. All Rights Reserved.